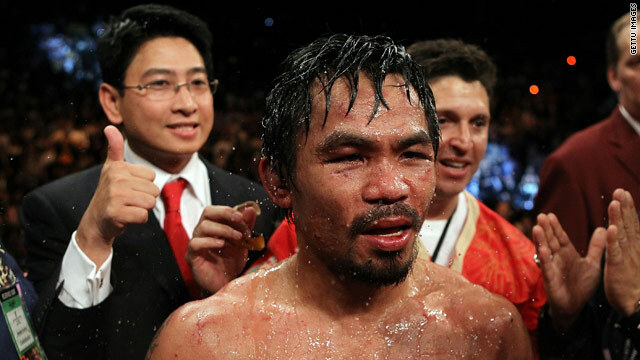 Pacquiao was expected to turn his attentions to Mayweather Jr. after seeing off Cotto in November. (CNN) -- The promoter for Filipino world champion boxer Manny Pacquaio, Bob Arum, has confirmed the "super fight" with American Floyd Mayweather Jr. will not happen after mediation talks between the two parties failed. "The fight is off, Floyd Mayweather walked away," Arum told the USA Today newspaper in a telephone interview on Wednesday. Pacquiao and Mayweather had asked retired federal judge Daniel Weinstein to help the two parties resolve a dispute, which had threatened to derail what was expected to be the most lucrative bout in the history of the sport. However, after two days of further negotiation, Arum said no agreement could be made with Mayweather, with the result that both fighters would now miss out on a potential purse of $40 million each. "It's not surprising. I always felt that he wasn't going to do the fight. He knows Manny will beat him. Mayweather's never stepped into the ring with a guy he had any question but that he was going to beat. Our guy was agreeable, Mayweather wasn't," the Top Rank promoter said. "That's why there's never been a (Shane) Mosley, there's never been a (Antonio) Margarito, there never was a (Miguel) Cotto, and there's no Pacquiao. "Floyd Mayweather is a coward. He will never fight anyone that will remotely give him a tough fight. "It would've made millions and millions, and he walked away from it ... I'm not disappointed in the sense that I always knew it was going to be this way." The welterweight title bout was thrown into doubt when Mayweather demanded that random drugs testing should be employed before the fight, a request that prompted Pacquiao to take legal action for defamation. Arum said Pacquiao will turn his attention to fighting undefeated Israeli WBA super welterweight champion Yuri Foreman on March 13 or March 20. Filipino pugilist Pacquiao had been infuriated by the insistence of Mayweather and his team at Golden Boy Promotions that both fighters submit to Olympic-style blood testing in the buildup to their pay-per-view extravaganza. Pacquiao filed a lawsuit in a federal court in Las Vegas last week for defamation against Mayweather and others for allegedly claiming he had used performance-enhancing drugs. The bout at welterweight appeared to be virtually set after other issues around the cut of the purse for each fighter were settled, but then the drug-testing row erupted over the Christmas period. Pacquiao became a five-weight world champion after his WBO welterweight title win over Miguel Cotto in November, while the unbeaten Mayweather returned from a 21-month retirement to beat Mexican Juan Manuel Marquez in September.